In Dausa, where Modi also played some drums, he made another precision attack on the Congress for neglecting ‘khadi’, connecting it to local history and lore. JAIPUR: As campaigning for the December 7 Rajasthan elections wound up, Prime Minister Narendra Modi ended his blitz on the ground with short, pithy but high-decibel speeches at two rallies, the last one in Dausa, to a considerable crowd, comprising a large number of women, dressed in brand-new floral-print sarees. The high point? The extradition of AgustaWestland chopper deal middleman Christian Michel to India — calling him the “raazdaar of the naamdaar” (the one who ‘holds the secrets’ of the Gandhi scion). In Dausa, where Modi also played some drums, he made another precision attack on the Congress for neglecting ‘khadi’, connecting it to local history and lore. But again, it was the Michel extradition that provided the real percussion. It formed a sharp retort to the Congress chief’s targeting of him on the Rafale deal throughout the campaign. “Modiji to bade neta hain, unka mukabla koi nahin kar sakta” (Modi is a big leader beyond challenge). This is a common refrain in Rajasthan, whether spoken by a Jat farmer slurping his roadside tea in Dudu, near Jaipur, or an upper-caste lady doctor sitting in her chamber in Alwar. But will the Modi factor be enough to sweep aside the tangible anti-incumbency against an imperious Vasundhara Raje? Ask the voter of Dausa, particularly in the villages, and their issue is water, jobs, the ban on bajri (mining of the river bed), and electricity not being available when they need it. But “Modiji has brought the BJP back into the game, making the undecided voters think twice,” says Ramjivan, who works at a small spectacles shop near Sikar, and doubles up as a BJP karyakarta in his free time. He calls himself one of the many new “educated voters” who can take an informed call and not go robotically by any ‘hawa’ (electoral wave) for change every five years. He points to huge billboards to prove it’s not just Kota or Alwar, coaching centres are popping up across the state, which he sees as an education hub. 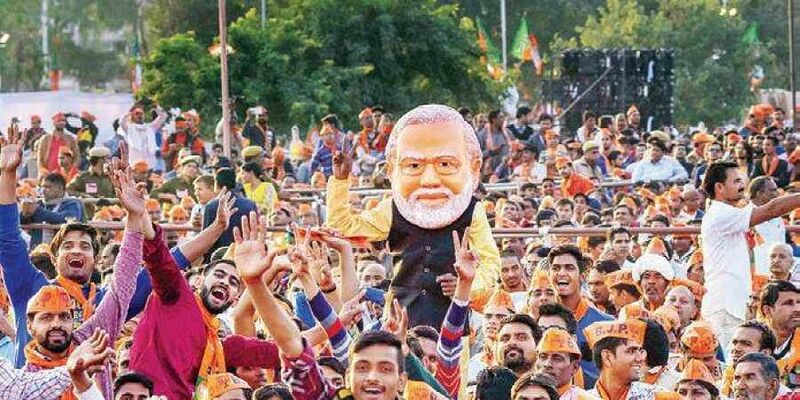 The undecided voters, estimated to be a huge 12 per cent, were a key target of the BJP’s strategic thrust, especially during Modi’s last-minute ‘surgical strike’. That’s what is making it a tough fight, inducing hitherto nervous BJP leaders “look forward to the results”. “Initially, it looked as if the Congress will have a cakewalk, but the situation changed, particularly after their candidate list came out. While we became focused and structured, their campaign lost steam when they started focusing on our themes: mandir, gotra, who’s a better Hindu etc. Plus, their internal dissonance at the top percolated down to the ground,” says BJP leader Sudhanshu Trivedi, who’s been stationed in Jaipur during the election period. The Congress, of course, does not agree. Party leader Rajeev Shukla says it’s anomalous to see it as a ‘conflict’ between the two leaders, Sachin Pilot and Ashok Gehlot, he pictures it as synergy — a one plus one factor. “You have Gehlot’s grassroots touch plus credibility and Pilot’s energy and youth appeal. They complement each other.” And the Michel extradition has come too late, he insists. C P Joshi, once a leader with CM ambitions, is contesting from Nathdwara and has been in the eye of a storm over casteist remarks against the PM. Now out of the big stakes, he calls the ‘conflict’ part of a ‘misinformation campaign’. “I can tell you about my constituency, I’m comfortable,” Joshi adds, implying that the attempt to make him a ‘victim’ of a ‘distorted video’ has not worked. Khalil Ansari, a prominent figure in Tonk and related to the local nawab’s family, says “very few” people turned up for Vasundhaa’s rally yesterday. And the BJP office was deserted, he claims. It’s as if “they know the game’s up.”BJP leaders, on the other hand, claim the “non-performance” of the Raje government is a misinformation campaign by the Congress that has failed. However, the rural folk in Khachariawas — late BJP veteran and former Vice-President Bharion Singh Shekhawat’s ancestral village in Sikar — said, “People made up their mind long ago. What good are welfare schemes if people have to be told during elections. People are against Vasundhare, even if they still have high regard for Modiji.” The local Congress candidate is favoured, therefore. In Dudu, the situation takes an opposite colour. Despite the two ‘prospective CMs’ Gehlot and Pilot campaigning in unison, the BJP has an edge. A former Congress MLA, contesting as an Independent, has changed the equations here. Plus, the Jat voters are “Modi fans”. The Congress gave the seat to Ajit Singh’s RLD, but he never came to campaign. If he had, the Jat voters here at least would have considered voting on the Congress side. In an election where the candidate seems to be the kingmaker, anti-incumbency can only be an add-on factor. Elections in the state will take place on December 7. There are 4.77 crore registered voters and as many as 2,274 candidates including 182 women in the fray for 199 out of the 200 assembly constituencies in the state. Polling is one seat has been postponed due to the death of the sitting Bahujan Samaj Party legislator.